Home › Cosmetic Dentistry › Can I Objectively Evaluate My Smile? It is no secret that a beautiful, pleasing, healthy smile can be your most revered physical attribute. After all, the first thing people notice is your smile. How do you know if your smile is detracting from your appearance? There are many troubles that are generally considered to detract from brilliant smiles. Missing teeth is a biggie. People who are missing teeth in the back of the mouth may mistakenly believe that the gap doesn’t show. They are usually wrong. When smiling, talking, laughing, or eating, a missing tooth definitely shows – even if the missing tooth is the very last molar. Furthermore, yellow or gray teeth diminish the appeal of a smile, even one that is perfectly healthy and aligned. Additionally, crooked teeth are ordinarily aren’t considered attractive. There are a few unique smile characteristics that some people proudly show off and others wish to change. For instance, a gap between the two front teeth can become your trademark. True Blood star Anna Paquin, actor Woody Harrelson, and singer Seal have retained their spaces. Perhaps the most famous gap-toothed smile belongs to seventy-year-old model Lauren Hutton who has proudly flashed it throughout her fifty-year career. Other celebrities such as Zac Efron, Tom Cruise, and Keith Urban weren’t happy with gaps so they transformed their smiles with unprecedented cosmetic dentistry. Can a Gallup Dentist Fix Your Smile? If you want an objective aesthetic evaluation of your smile, how can you do this? You can’t see your smile from every angle when you look in the mirror. 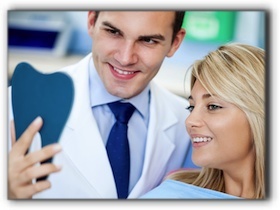 If you want an expert opinion on the attractiveness of your smile, talk to a Gallup dentist. There are a surprising number of design principals that are used in cosmetic dental smile makeovers. These include size, shape, alignment, proportion, color, and translucency. In addition, cosmetic dentists also consider the characteristics of the gums, lips, and facial features. When you have a cosmetic dental consultation, you will be able to see how the essential elements work together to create a natural-looking, standout smile. Bottom line? If you want to change your smile, you can with dental veneers, dental implants, and teeth whitening! Schedule a consultation today by calling a Gallup dentist at 505-985-5626.